Cafe is the main part of Munich’s culture. Being the capital of Bavaria in Germany, it has a large population. People from various cultural backgrounds co-exist with each other in this city. Being a major center of art, technology, culture, education, business, and tourism in Germany, it enjoys a very high standard and quality of living. As part of the local lifestyle, Munich’s cafe culture goes from traditional venues to modern venues crossing the city. It is not about a cup but a significant lifestyle. Seven cafes in the center around the shopping area and next to the main tourist attractions are with some unique features. This is a funny cafe based on cat themes. It has six cats rescued from the local animal shelter. Each of them has a name. Guests can play or cuddle with them during their stay. Sometimes they are high on the cat shelves and observing the crowds below. Other times they withdraw themselves to their cat room for a snap. There are some play corners decorated for these cats. Guests can also buy products with cat prints on. These cute cats are even having their photos on postcards. You will see cat pictures almost everywhere: on the menu, on the wall and also on the door of the toilet. In this cozy small cafe venue, guests can also enjoy a leisurely breakfast, lunch, and dinner. Being a vegan-vegetarian this place only offers plant-based food (with the exception of organic cow milk as an alternative to various plant-based milk). Cafe Katzentempel is a nice place special if you are a vegetarian or an animal lover. In 1888, the opening of the legendary Cafe Luitpold was known as palace cafe. At that time it was one of the biggest and most fashionable coffee houses in Europe. But During the Second World War, it was damaged. After extensive rebuilding, it was reopened in 2010. The building today is less complex compared to its first design. The Café offers everything from breakfast to lunch and dinner as well as a selection of cakes. The coffee bar opens during the day. In the evening only the restaurant part opens. It is an urban coffee house with charm, style, and a metropolitan atmosphere. It is a nice spot for business lunch and afternoon cakes. In the Cafe Luitpold there is also a museum. The museum has a collection of the glorious days of the European coffee house culture. Every morning the museum opens a window to the bakery; in the afternoon short films about Luitpold layered cakes, etc. are shown there. The entrance to the museum is located in the palm tree garden of Cafe Luitpold. Dallmayr is one of the best-known German coffee brands. Over its 300-year history, the company has extended its businesses from Coffee & Tea into Delicatessen and Gastronomy, Party and Catering business. You can buy this German coffee online. The coffee house is part of its headquarter and situated on the upper floor of its building. Other than Dallmayr coffee you can choose various high-quality coffee such as Ethiopian Crown, San Sebastián in Guatemala and Grand Cru Hawaii Kona. The quality service is presented in every detail. If a guest orders a tea, a sand timer is also placed on the table. There are different sand timers for different teas. As different teas need to brew for different lengths of time this sand timer will keep you brewing the right way. The Rischart is a traditional coffee and bakery house which has many branches in Munich. The most famous one is the one on Marienplatz 18, right at the beginning of the pedestrian zone. On the ground floor, it offers many types of fresh baked German bread, desserts and sweets. On a busy day, you would have a problem to enter the shop, it just had too many customers. This is also the most visited backer shop in Germany. It is also one of the hosts for annual Oktoberfest. On the upper floor is the coffee place which offers breakfast to afternoon cakes. It is the ideal place for viewing busy life on Marienplatz. If you prefer to have less busy surroundings, on the Viktualienmarkt, there is also a branch which offers the same product. It has a roof-top open terrace and offers pleasant views of the busy Viktualienmarkt. Chocolaterie Beluga is a very small cafe venue. There are only several high seats next to the wall. Most seats are placed outside. Within several square meters, this cozy and inviting cafe offers prime quality chocolate products. The tasty chocolates are sold either as a hot drink, pralines or cakes. Among those products the hot chocolate “, a chocolate-on-a-spoon” is something you should try. Some of those have alcohol (for example rum) in a capsule linked to a block of chocolate. You place the chocolate part in the hot milk. When the chocolate melts the rum flows into the drink. Chocolaterie Beluga has also opened a new one underneath the Marienplatz, in the subway entrance area of the old townhouse. Address 1: Chocolaterie Beluga – Viktualienmarkt 6, 80331 München. This small cozy old style cafe offers a type of sweet delight, the Schmalznudel, a freshly fried dough. Every morning after setting up their market booths owners from Viktualienmarkt go to this place to have some Schmalznudels with cups of coffee for a break. During the day many people buy them and just eat on the road. When people finish their shopping at the market, this is a perfect place to have a rest. It is interesting to see that people eat Schmalznudel not only with a cup of coffee or juices but also with a glass of Sekt (a type of sparkling wine). 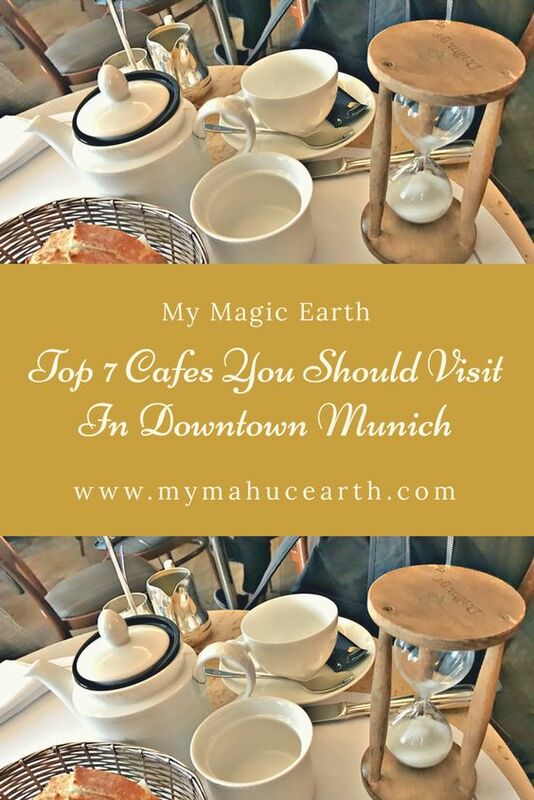 In case you are looking for local delicacies in Munich this place is a must visit. This is a coffee stand at the Viktualienmarkt. It is a lovely small coffee shop with a few high tables but no sitting place. During the market time, you need to queue for the coffee. It is a great place to enjoy coffee and enjoy the sights of the market. Kaffeerösterei performs own roasting process. The roasting transforms green coffee into the aromatic brown beans. Roasting machines must maintain a certain temperature in order to produce the flavor and aroma of the coffee. High skill and technique are required for the entire process. Using fresh beans and fresh organic milk Kaffeerösterei makes its coffee simply better. I haven’t made it to Germany yet, but Munich is the place I would most like to visit in this country. I would love to go during the Oktoberfest, not just for the fest, but also for other attractions, like the cafes you recommend here.